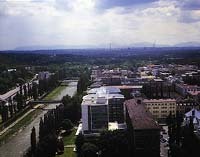 The ICCF Congress, in conjunction with meetings of the Presidium and the Commissions, took place in the Atom Hotel, Ostrava, from 11th to 18th October 2003. 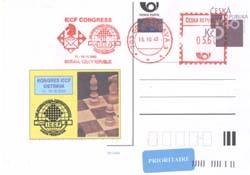 The Congress was arranged and hosted by the Czech Correspondence Chess Association. Participants of the Congress, and accompanying families and friends, were offered an excellent programme of events, including an excursion to the town of Olomouc and a special visit to Krakow, in Poland. There was also a programme for ladies and families provided by the hosts. ICCF President, Alan P. Borwell (SCO) referred to the only previous occasion when an ICCF meeting had been held in the Czech Republic in 1966, when the ICCF Presidium met in Prague (then Czechoslovakia). At that time, the ICCF General Secretary was Dr. Bohuslav Lukáš (CZE), who served ICCF in that important position for nearly 30 years. He also informed Congress that in 1973, a rather special tradition had been started with meetings in Poland at 10 year intervals and he was delighted that the hosts had arranged a special visit to Krakow (POL), during the 2003 ICCF Congress. Since its origins in the 1880s, there had been many fine performances by Czech players and teams in ICCF title tournaments and the President highlighted both individual and team achievements, in his address to Congress. The President paid tribute to the memories of all CC friends who had died since the Seixal 2002 Congress, including Haresh Samtani, ICCF delegate for India (AICCF) and former Ukraine delegate, Ms. Elena Salnikova. Delegates stood in silence to the memory of all departed CC friends. 1. ICCF delegates should try to look at the ”bigger picture” of correspondence chess, rather than taking narrow national, commercial or personal perspectives. A real vision was required to look beyond existing horizons. Relationships between member federations and ICCF needed review, particularly financial/entry fee arrangements. 2. ICCF should be prepared to consider partnerships with other organisations which have compatible objectives and which could not undermine ICCF’s relationships with international CC players and member Federations or countries or erode its unique position as the World authority for official CC titles, ratings, etc. ICCF must always have effective control of its tournaments, systems and databases. 3. ICCF should always endeavour to provide opportunities for players of all standards, to participate in individual and team events, according to their personal choice of postal, Email or webserver, methods of transmission. The arrangements for future events, including title tournaments, required harmonisation of all three methods of play. 4. Much more urgency and all year round activity was required by ICCF Commissions, especially for issues such as rules or guidelines reviewing, where problems had been identified. Well considered proposals were required by each ICCF Congress, to facilitate good decision making and appropriate timing of implementation of changes or improvements. 5. Because of the unexpected retirement and/or inactivity by some elected/appointed officers, there had been too many tasks which had needed to be completed by Senior ICCF Officers, beyond their own defined duties. It had caused an ”overload” situation, was not in the best interests of ICCF, and a full review of ICCF Statutes and operating arrangements should be initiated, prior to the 2004 Congress, for decisions to be taken next year. In conclusion, Mr. Borwell expressed his sincere thanks to delegates and officials for the support they had given him during his period in office and said that it had been a wonderful experience and privilege to serve as ICCF President, especially through the ICCF 50th Anniversary. He paid tribute to his wife Moira for her support to him and ICCF during the 20 years he had served as a member of the ICCF Presidium. He intimated that, after election of his successor and the new Executive Board, he would leave office so that the new team could continue the Congress meetings and make necessary plans and arrangements, for the future. Expressing hope that delegates and friends would enjoy Ostrava with ”amici sumus” spirit prevailing throughout, the ICCF President declared the 2003 ICCF Congress, duly opened. Before the elections began, delegates heard a proposed ICCF Anthem, composed by Dmitry Lybin (BLR). The Acting General Secretary showed the Ballot Form to be used in the Election procedure, and after appointment of Election authorities, the following candidates were elected to office: President: J. Mrkvička (CZE) by unanimous vote, Deputy President & Development Director: M. Zavanelli (USA) by majority vote. Membership & Services Director: P.F. Hegoburu (ARG) by substantial majority vote. Finance Director: G.V. Hill (USA) by substantial majority vote. World Tournament Director: J-C. Lüers (GER) by substantial majority vote. Congress then approved unanimously the re-appointment of H.B. Sarink (NED) as ICCF Auditor. Immediately after the elections, the ICCF President A.P. Borwell proposed that the whole Presidium should retire, effectively at midnight October 12th, 2003. Congress approved this proposal. It was also approved that the newly elected Executive Board should take office as from October 13th, 2003 until December 31st, 2007. Elections of Zonal Directors would be arranged according to ICCF Statutes, with appointments taking effect from 1st January 2004. Finally, a proposal to co-opt the Treasurer C. Flores Gutiérrez (ESP) until he finished work on the 2003 Accounts and had reported about them to the 2004 Congress was also approved unanimously. Upon a proposal by the newly elected ICCF President, Congress unanimously elected Mr. Alan P. Borwell as ICCF Honorary President. He humbly and graciously accepted this honour, with thanks and appreciation. A Bertl von Massow medal in Gold was awarded to: Evgeny Karelin (RUS), Michael Müller-Töpler (GER), Prof. Max Zavanelli (USA) for more than 15 years of meritorious work in the organisation of ICCF.